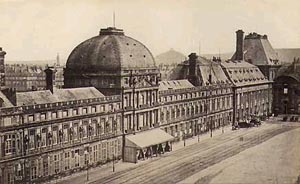 In Paris, the National Assembly continued to struggle to create a constitution, and it attempted economic relief. In November 1789 it nationalized Church lands (ten percent of France's available land), claiming that it was retrieving land that belonged to the nation which the Church had been holding in trust. And in April 1790, the National Assembly issued paper money, the assignat, backed by the value of these lands. On July 14, people from across France gathered in Paris to celebrate the first anniversary of the fall of the Bastille. Ceremonies and declarations of loyalty to the revolution and to national solidarity took place. And nature was accommodating them. Better weather in 1790 made better harvests, bringing some relief, with many believing that God was siding with the revolution. The National Assembly abolished the tariff barriers that had been a moneymaking device for local nobility. And on March 2, 1791, the National Assembly abolished trade guilds and corporations, believing they were vestiges of a society based on privilege. This included employers' associations, and laborers now felt free to press for higher wages. On June 14, the National Assembly intervened and prohibited all organizations of workers and collective worker actions. They forbade local authorities accepting representations from any worker group or to offer employment to a member of any such group. Louis' home in Paris, the Tuileries palace. The National Assembly, meanwhile, was moving to put all religion under its authority. Deputies to the National Assembly were mostly Christians, and they saw the message of Jesus as supporting liberty, tolerance and against despotism. In their opinion their revolution conformed to Christian principles. They believed, as had Voltaire, that the masses needed religion, that religion was a civilizing force and that the Gospels had a moral and humanistic value. They saw no conflict between reason and religion. Both, they believed, were directed toward human welfare and happiness. They also favored putting organized religion under the control of the revolution. They wanted a church for the nation that was less opulent than the Roman Catholic Church. They wanted the government to oversee the elections of pastors and bishops, and they wanted clergymen to swear loyalty to this plan. About half of the clergy refused. In places across the country, violence broke out between supporters of the revolution and defenders of the Church. In March 1791, Pope Pius VI damned the attempt to apply state authority over the Church. Louis XVI was a devout Catholic, and he was troubled by it all. More suspicion was heaped upon him by those supporting the revolution. Louis was accused of sheltering priests who had refused to take the oath of loyalty to the state. In April 1791, Louis wanted to perform his annual Easter devotion at Saint-Cloud, ten miles west of Paris, but a mob surrounded his carriage and prevented his departure. Louis was feeling harassed by the zeal of those supporting revolution. He was irked by being made a prisoner in his palace and by revolutionary soldiers keeping an eye on his wife as she slept. And he was upset by those in power having forced upon him "constitutional" priests pledged to the state rather than the confessors and priests of his choice. King Louis wrote a note denouncing the revolution and on June 20 he fled in disguise with his family. He was caught about 20 kilometers from the Austrian Netherlands (today, Belgium). On June 25 he was returned to his Tuileries palace. The king was now more obviously a prisoner, and the National Assembly suspended his official powers. In July the National Assembly split over whether the king should be absolved for his attempt to flee. The following day a Parisian mob, wanting to save France from a traitor-king, rioted. The National Guard, still led by Lafayette, dispersed the demonstration by firing into it, striking about sixty of the demonstrators, and this convinced people in Paris that deputies to the National Assembly despised ordinary people. However much deputies to the National Assembly were displeased by Louis XVI, they still wanted a constitutional monarchy not unlike what existed in Great Britain, and they remained afraid of the extremism of the propertyless, including demands for the sharing of property. In August the deputies altered a number of clauses in the constitution, adding protections for property owners. The constitution was completed on September 3 and sent to the king for acceptance. The constitution confirmed the existence of a hereditary monarchy with limited veto powers: the king could temporarily stall legislation with his veto but he could not veto any legislation permanently. The king was to have no control over the army, no authority over local governments, and he could send no representatives to serve in parliament. There was to be a single legislative house. All judges were to be elected, and voting was to be by all who paid taxes equivalent to three days wages or more. The constitution repeated some of what was said in the Declaration of the Rights of Men and Citizens: all men were said to be born with equal rights, and everyone was said to be free to speak, write or print his opinions provided he did not abuse this privilege. And the amount of taxes that a person paid was to be based on the amount of wealth he possessed. The king gave his acceptance of the new constitution on September 13. Amid widespread rejoicing, the revolution appeared complete. Public opinion appeared largely supportive, with some aggravations as a result of government attempts to exercise authority over religion. The revolution appeared able to handle opposition plots here and there, but the common menace of over-reaction remained.